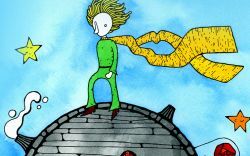 OP’s colorful and engaging addition to the holiday performing arts calendar, Rachel Portman’s The Little Prince, returns for the second year. Academy Award-winning English composer Rachel Portman’s magical opera in two acts comes to the Opera Parallèle stage with a twist, in collaboration with the San Francisco Girls Chorus. Antoine de Saint-Exupéry’s beloved story of a charming prince who falls from space into the Sahara Desert takes on even more universal appeal and a feminist touch with the principal characters played by women and girls. This original production brims with digital magic, animated illustrations, and a cast of fantastical characters including the Prince and the Pilot, stars and birds, the King, a Businessman, the Rose and others. They interact with each other and the animation as they explore the universe in search of love, meaning, and the answers to life’s biggest quandaries.